Ross Dawson, a self-described leading futurist, entrepreneur, keynote speaker and best-selling author says newspapers, as we know them today, have one foot in the grave and the other poised for resurrection, on an iPad or similar device. His speaking notes as the keynote speaker at Newspaper Publishers Association Future Forum conference in Sydney include these points. By 2022 newspapers as we know them will be irrelevant in Australia. However the leading newspaper publishers of today may have transformed themselves to thrive in what will be a flourishing media industry. Media revenues will soar but will be unevenly distributed. We are shifting to a “media economy” dominated by content and social connection. Yet established media organisations will need to reinvent themselves to participate in that growth. The successors to the iPad will be our primary news interfaces. Australians will most commonly consume news on portable devices, of which the iPad will be recognised as the forerunner. Digital news readers will cost less than $10. By 2020 entry-level devices to read the news will cost less than $10 and often be given away. More sophisticated news readers will be foldable or rollable, gesture controlled and fully interactive. Journalism will be increasingly crowdsourced. Substantial parts of investigative journalism, writing and news production will be ‘crowdsourced’ to hordes of amateurs overseen by professionals. The reputation of individual journalists will drive audiences. Many journalists, most leading experts in their fields, will still be employed in Australia, with public reputation measures guiding audiences on how much to trust their work. 2022 is a clever prediction. Most of the baby boomers will be retired. What smart people, including Ross Dawson, understand is that despite what you read, or how, content is king. Without it, you will be looking at a blank screen on your iPad. The challenge, as always, is how do you get people to pay for newspaper content repurposed online, when for 10 years it has been free. Do you trust your neighbour, your doctor, minister and mechanic? Would you take advice from your mechanic on a new doctor, or your doctor on a new church? Throughout our lives we build relationships with people. We not only trust them for what they promise, we often trust their opinions about things that they might not know much about. How often have you heard a neighbour or a friend say I have a really good lawyer, accountant, butcher, baker or candlestick maker. Most of my neighbours don’t know much about any of these people. They do know that they trust the relationship they have developed and are happy to pass that along to me. A referral. In networking parlance, a referral is the golden goose as in I know and trust my new networking buddy well enough to refer him to one of my trusted business associates. The door opener. Some organized networking groups force referrals and insist that participants swap names every week, providing new referrals for other participants. So either they have been holding out, like last week, or they have developed this deeply trusting relationship in the last seven days and they are about to share it with me. 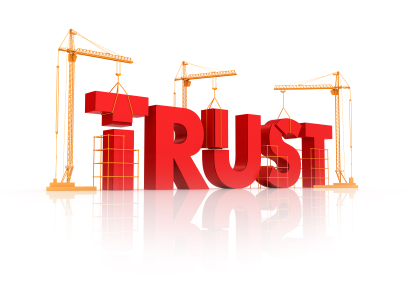 Trust is at the center of all business relationships. But trust has to be earned. It must be BRIEF -50 words or less and in plain English and not some marketing blather that sounds good but says nothing. What you do and WHY I need your product or service? Be clear, specific and honest. There must be a compelling reason for people to switch from your competitor(s) so the why I should choose you is the most important question to answer. BE POSITIVE – Fear was once a great motivator. Who wants ring around the collar? Today it’s too easy for people to find solutions on the Internet. Tell people how you’re going to help them and not what might happen if they ignore your sage advice.. Millions of Americans use Twitter — but they won’t pay for it according to the annual study of the impact of the Internet on Americans by the Center for the Digital Future. Some 49 percent of Internet users said they have used Twitter, but when asked if they would be willing to pay for Twitter, zero percent said yes. The report illustrates the struggle that media companies, who have been providing free content from the beginning, have in trying to transition to the Internet. Once free, it’s nearly impossible to get people to pay for it. The study found that half of Internet users never click on Web advertising, and 70 percent said that Internet advertising is “annoying. ” However, 55 percent of users said they would rather see Web advertising than pay for content. And more trouble for media companies, in particular newspapers. Newspapers rank below the Internet and television as primary sources of information. Only 56 percent of Internet users ranked newspapers as important or very important sources of information. Now here’s the strange stuff. Sixty-one percent of users said that only half or less of online information is reliable — a new low level for the Digital Future Project. And 14 percent of Internet users said that only a small portion or none of the information online is reliable. So why? Convenience? Delivery method? Is it better to have information that is reliable half the time delivered to your Smart Phone as it happens rather than wait for the morning newspaper to be delivered? Is speed the determining factor? Undoubtedly, that’s part of the equation. What do you think?